This Let’s Talk Hook-up Shimano Seminar trip had 32 passengers and they caught 70 albacore and 23 bluefin tuna. The jackpot winner was: Rey Rodriquez, La Habra, CA — 50 pound bluefin. In 1970 crew members and anglers considered the new 95-foot Cape Polaris to be the Cadillac of sportfishers. Others cursed it. Jack Mahon, currently night manager at Fisherman’s Landing, remembers working on a charter boat when the hulking Cape Polaris came to San Diego Bay. "When the Cape Polaris motored by the bait receivers, her huge wake set the smaller charter boats rocking, sliding plates around the galley and making the bait-loading process a real challenge," recalls Mahon with a grin. The mixed reaction quickly changed to awe and admiration as the Cape Polaris , with owner Bill Poole at the helm, chartered new waters….literally. On May 24, 1970, in Newport Beach, California, the Bill and Ingrid Poole family proudly launched "the largest sportfisher on the West Coast." She was named the Cape Polaris in part by Bob Fletcher, currently president of Sportfishing Association of California, who entered the name in a contest. "Cape sounded large and powerful to me," remembers Fletcher, "so it fit the boat." The Cape Polaris become another in the line of famed Polaris boats built by Poole Boats. "The new breed of boats is here to stay." reported Larry Levinson, one of 200 spectators at the launching. He described the "huge" walk-around stern bait tank, the outside bridge, hot showers, and deck storage racks as new features for a sportfisher. And as the champagne bottle shattered against her hull and the fully clothed owner was tossed into Newport Bay, sportfishing changed forever. Instead of waiting for warm water conditions (and the targeted fish along with it) to appear off San Diego in the summer within range of the boats of the day, Poole decided to build a boat equipped to get to the fish grounds. Such a boat would need sufficient fuel and bait capacity to get to Cabo San Lucas and environs for the prized tuna, sailfish, grouper, and yellowtail …wherever they lurked. "Now sleek powerful, luxurious, self-contained sportfishers make it possible to fish year-round," wrote LA Hearld-Examiner staffer Jim Brezina on June 24, 1970. During the 15 months of construction, the hull was designed, fuel capacity determined, and walk-around bait tanks installed, but Ingrid Poole dreamed of the perfect creature comforts for their newest project. She knew women would accompany their fishing fanatic husbands and lady anglers would jump aboard if she could have her way with a few details. On a previous Polaris boat, Poole was thrilled just to have two heads, a step up from his earliest boats. "The shower sprayed over the sink and toliet, but there were TWO HEADS!" recalls Ingrid. For Cape Polaris , she designed plusher and private accomodations and comfortable restrooms with enclosed hot-water showers. The dining salon would have drapes, a color scheme, and air-conditioning. The cook would serve delicious meals from her double-ovens and the atmosphere would attract all anglers—male and female. Bill Poole departed with 30 passengers, including at least two women, on the maiden "long-range" (a new term) voyage June 12, 1970. At San Benito and Cedros Islands they found cold, green water. It was then that Bill made another decision momentous to long-range sportfishing. He pointed the boat (with only radar to guide him) south for Alijos Rocks. With a boat capable of 20 knot speeds, he zoomed this history-making group to some of the finest fishing grounds around even by today’s standards. They "loaded up" and Poole had to head for home a day early. The 15-ton fish hold was full of 300 yellowfin tuna (30-80#), 340 yellowtail (20-50#), 10 grouper, 6 albacore, 4 bluefin tuna, 2 black sea bass, and 1 marlin. Thirty eight hours later, they docked at Fisherman’s Landing where media and anglers awaited the weigh-in. In those early years, the price of a trip on the Cape Polaris cost around $40 per day. You could jump on a 10-day trip to Alijos Rocks for $400 or a 7-day trip in December for $385, but that one was limited to 24 passengers, a limited-load trip. In January, 1973, Gene Tolson of Gardena caught a record-size 308 pound yellowfin tuna and thus the "100 Pound Club" was born. 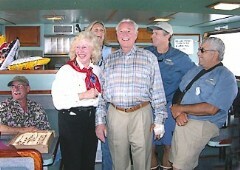 Anyone who caught a tuna, billfish, or grouper over 100 pounds aboard the Cape Polaris received a pin or jacket patch and an invitation to an annual party hosted by Bill and Ingrid Poole. Imagine the fish stories. In 1975, the boat’s name was changed to Searcher . Since 1985, Art Taylor has owned and operated Searcher , still out of Fisherman’s Landing, finding a niche in the shorter-range (3 and 4-day) trips during the summer, and longer (5 and 7-day) trips in the spring and fall. Newer, larger, and plusher San Diego sportfishers have joined Searcher in creating more long-range fishing history into the 21st century. But Searcher was a first in many ways, and is still plying the fishy waters of San Diego and Baja California with a large dose of 1970 Poole Pride.